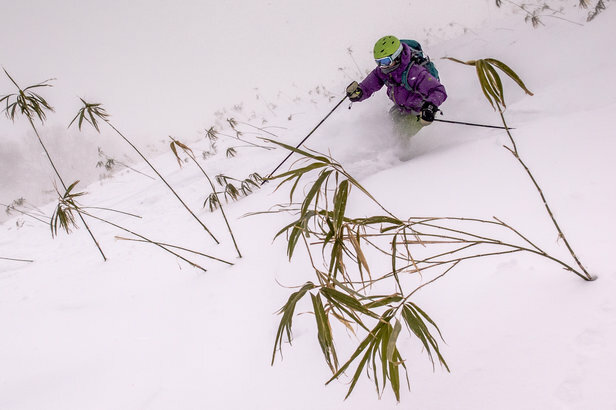 Skiing through beautiful bamboo in Niseko. There are six ski areas near Niseko, but our trip centered around Niseko United, which is actually four interconnected ski areas accessible by one pass—all located on the mountain called Niseko Annapuri (elevation: 4,291 feet). The four resorts include Niseko Annapuri Ski Area, Niseko Village Resort, Niseko Grand Hirafu Resort and Hanazono Resort. Interestingly, Hanazono is owned by an Australian company (attracting a large number of Australian tourists to the area) while the others are owned by a Japanese company—but they share services like lift tickets and mountain shuttles. It’s not always apparent that you’ve crossed over to another resort unless you’re reading the signs or trail map, though they’re set apart by some noticeable details: Hanazono has long cruisers, tree runs and terrain parks; Niseko Grand Hirafu is the largest of the four; Niseko Village has long rolling trails and tree runs; and Niseko Annupuri has a smaller base and relaxed vibe. What they all have in common? Amazing views (on the small percentage of clear days) of Mount Yotei, an iconic, cone-shaped inactive volcano often referred to as the Mount Fuji of Hokkaido. Niseko lore says skiing dates back to 1912 when a Lieutenant Colonel from the Austrian-Hungarian army skied Mount Yotei while inspecting Japanese troops. The Japanese army asked him to provide ski training to soldiers. Ski training continues today, and we saw skillful camouflaged soldiers training on the slopes of Annaupri on long, straight skis with bear trap bindings. In 1961, the first lift was installed on Hirafu. More and more lifts were installed, and in turn, more hotels built, especially around the skiing boom brought on by the 1972 Winter Olympics in Sapporo. Niseko continues to change rapidly and more luxury accommodations are in the works: coming soon will be a Park Hyatt in Hanazono, touted as the first 5-star hotel in Hokkaido as well as a Ritz-Carlton opening in Niseko Village in 2020. I met an Australian tourist who has been coming to Niseko since the 80s. Back then, he said, there were still traditional Japanese houses with tile rooftops, all demolished in favor of hotels and restaurants. Not to worry, there’s still a lot of charm to go around. Catching the tail end of a high-pressure meant the photos ops of Mount Yotei were plentiful, but had us worried about our chances for a taste of the legendary “Japow.” Skiing over dirt patches and through bamboo groves one day gave way to a landscape submerged under two feet of snow the next. The powder came in quick and changed the entire vibe of the mountain, and our guides knew just where to find the goods. Japanese locals didn’t seem too interested in skiing much off-piste, but the “gaijins,” or foreigners on skis and snowboards (including a sizeable expat community skewed heavily Australian), love to look for fresh tracks. A bit of a culture clash ensued between the rule-breaking rope duckers and patrol, which we found out the hard way via the loud-speaker-endowed lift towers that either play pop music or make announcements. To my surprise, as I ventured over to a powder stash in a picturesque stand of snowy Japanese white birches, the voice was speaking in English… to me. It said, “Sorry, that area is closed.” It was a gentle reprimand, considering I was being surveilled and called out over a PA system. 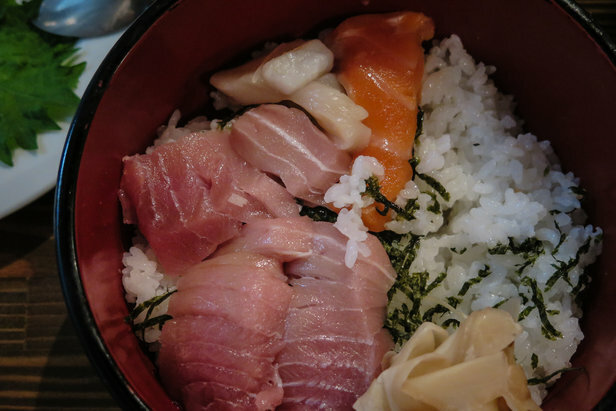 To me, returning to Japan was like visiting an old friend. Some things seemed really familiar—the food, the language, the culture of helpfulness and politeness, where lift operators “invite” you to ride the chairlift, and if you ask for directions, Japanese people will drop what they are doing just to help you. In Zen Buddhism, Zazen is a meditative discipline used to reach an awareness of the continuing change in our consciousness through all of our sensations. Jack Kerouac wrote about Beat Zen, but I’ll call our experience “Ski Zen” because skiing in Japan does change one’s consciousness through sensations. Whether it’s gazing at the volcanic Mount Yotei, feeling the whoosh of bamboo against my ski boots, watching the big flakes float like diamonds out of the ski or the first taste of steamy homemade broth in a big bowl of ramen—it all had a kind of sensory-loaded spiritual glow. I’ll admit, however, that glow could have been enhanced by Hokkaido-brewed Sapporo Classic beer and Nigori, or “cloudy” sake.